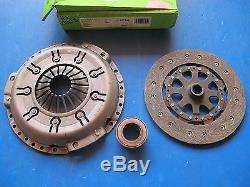 Valeo clutch kit for audi 80, 100, convertible, coupe, a6! Audi 80 2.6 e v6 b4abc2 08 / 92-> 06/95. Audi 80 2.6 e v6 8c27h4 05 / 93-> 06/95. Audi 80 2.8 e v6 09 / 91-> 06/95. Audi 80 quattro 2.6 e quattro v6 and before ba / b4 and abc2q 07 / 92-> 06/95. Audi 80 quattro 2.6 e quattro v6 and before 8c27 and 8c57 07 / 93-> 06/95. Audi 80 quattro 2.8 e quattro v6 and before 09 / 91-> 06/95. Audi 80 before 2.6 e v6 baabc2 08 / 92-> 07/95. Audi 80 before 2.6 e v6 8c5 / 7d4 and 7h4 07 / 93-> 07/95. Audi 80 before 2.8 e v6 08 / 92-> 07/95. Audi 100 sedan 2.6 v6 e c4abc2 and 4a2 04 / 92-> 07/94. Audi 100 sedan 2.6 v6 e 4a20e4 07 / 92-> 07/94. Audi 100 sedan 2.8 v6 and v6 e 12 / 90-> 07/94. Audi 100 quattro 2.6 v6 and before 03 / 92-> 07/94. Audi 100 quattro 2.8 v6 and before 12 / 90-> 07/94. Audi 100 before 2.6 v6 e caabc2 and 4a50 04 / 92-> 07/94. Audi 100 before 2.6 v6 e 4a50e4 07 / 92-> 07/94. Audi 100 front 2.8 v6 e 10 / 91-> 07/94. Audi cabriolet (8g) 2.6 e v6 01 / 94-> 05/94. Audi cabriolet (8g) 2.8 e v6 11 / 92-> 07/94. Audi Coupe (8b) 2.6 e v6 8b30f4 and bbabc2 08 / 92->. Audi Coupe (8b) bbaah2 09 / 91->. Audi a6 series i 2.6 e v6 4a20v4 and c4abc2 07 / 94-> 03/97. A6 series i 2.6 e v6 4a20d4 07 / 95-> 03/97. A6 series i 2.8 e v6 07 / 94-> 03/97. A6 before series i 2.6 e v6 4a50v4 and caabc2 07 / 94-> 09/97. A6 before series i 2.6 e v6 4a50d4 07 / 95-> 09/97. A6 before series i 2.8 e v6 4a50r4 and caaah2 07 / 94-> 09/97. A6 quattro 2.6 e v6 and before ca / ​​c4, abc2aq and a420 / 50 06 / 94-> 07/96. A6 quattro 2.6 e v6 and before 4a20d5 and 4a50d5 08 / 94-> 06/96. A6 quattro 2.8 e v6 and before 06 / 94-> 07/96. Expected payment up to 7 days after the purchase of the item! The VAT is recoverable over the entire invoice by the professionals subject. Possibility of being refunded within 7 days after reception if the object does not suit you. The return shipping costs remain your responsibility. Put your items on sale quickly and easily, and manage your ads in progress. The item "valeo clutch kit for audi 80, 100, convertible, coupé, a6" is on sale since Thursday, November 9, 2017. It is in the category "auto, motorcycle parts, accessories \ auto \ parts \ systems transmission \ clutches \ other parts ". The seller is "comptoirdelavoituremoderne" and is located in / in aslonnes. This item can be shipped to the following country: europe.